Two years ago we were sitting in my living room with the front door open at street level for the breeze. Erik Lundquist and his gal poked their heads in, introduced themselves, and asked if we wanted to come upstairs to their apartment for a beer. We talked about line art and illustrating and I (not so) silently lost my cool looking around his studio. After we left I talked about how lucky I was to live below someone whose work I admired so whole heartedly. Not only has he remained one of the kindest and most inclusive artists I’ve encountered, but his talent constantly astounds me. 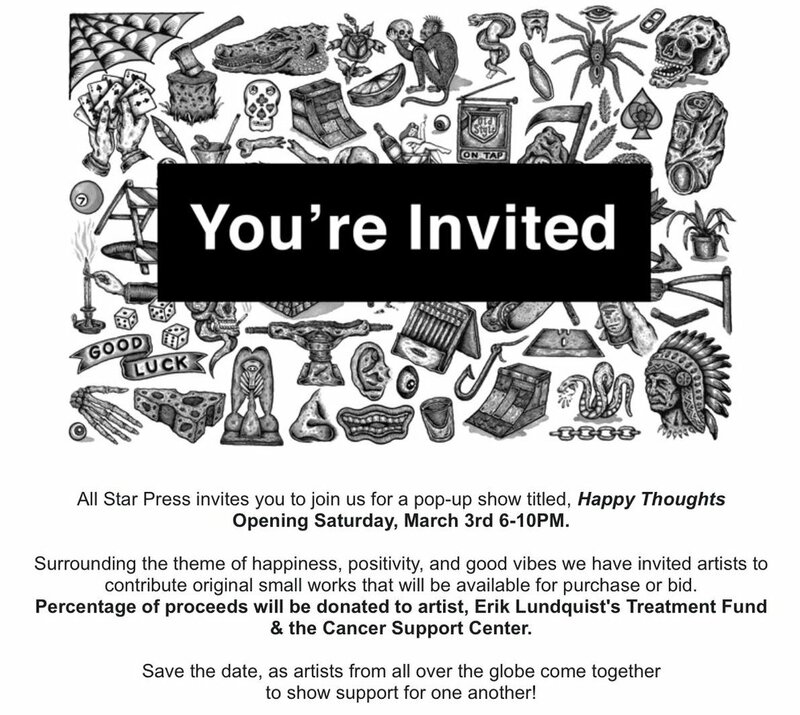 This Saturday, March 3rd from 6-10PM a whole heap of Chicago artists are putting up cash & carry “Happy Thoughts” themed pieces at All Star Press to support Erik's Treatment Fund & The Cancer Support Center Charity. Come on out and show some love from someone who truly deserves it. My “Happy Thought” comes straight out of my happy place in South Florida where I’ve spent this winter sitting by the canal across from this building, taking shade under palm fronds, drinking coffee, and learning which fish were which. Some of the best things in life are still free.